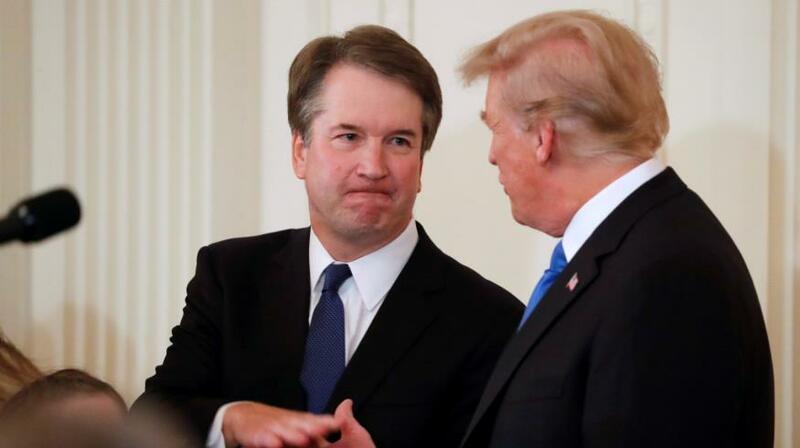 United States Senators will hold public hearings next week to hear from a Supreme Court nominee and a woman who has accused him of sexual assault. The Senate Judiciary Committee completed confirmation hearings for nominee Brett Kavanaugh on September 7. Then, a week ago, the Intercept online news site reported on a letter containing possibly damaging information about Kavanaugh. On Monday, a university professor in California said she was the writer of the letter. Christine Blasey Ford told the Washington Post newspaper that Kavanaugh assaulted her in 1982, when they were both in high school. She said he forced her into a bedroom at a party at a home near Washington, D.C. She said he groped her and tried to remove her clothing. She also said Kavanaugh put his hand over her mouth when she tried to shout for help. Ford told the Post, "I thought he might inadvertently kill me." Kavanaugh has denied remembering anything about that reported party. He said he has never attacked any woman. Senator Chuck Grassley, a Republican from Iowa, is chairman of the judiciary committee. He said Monday the committee would hold a public hearing early next week to "provide ample transparency." But Ford's lawyers have called for a federal investigation of her claims before she speaks to the Senate. The lawyers argue that some senators appear to have already decided that they believe Kavanaugh instead of Ford. On Wednesday, Grassley released a statement saying, "Nothing the FBI [Federal Bureau of Investigation] or any other investigator does would have any bearing on what Dr. Ford tells the committee, so there is no reason for any further delay." The statement again extended an invitation to Ford to speak to the committee. Ford's lawyers say she has received death threats and other danger since going public with her story. Republicans on the committee had hoped to hold a vote as early as Thursday of this week to move Kavanaugh's nomination forward. President Donald Trump spoke about the issue Wednesday morning. He said it was "very hard" for him to imagine that Kavanaugh had acted as Ford has described. But, he said he hopes Ford will appear at the hearing. "I really want to see her, to see what she has to say," Trump said. They sent death threats and daubed his home with slogans. I did not scream or shout for help. Any further delay would result in additional financial consequences. Public hearings have been held by some local courts since March this year. 5.The lawyers argue that some senators appear to have already decided that they believe Kavanaugh instead of Ford. It looks like an innocent bystander was killed instead of you. It felt like I'd had two babies instead of one. 6.Nothing the FBI or any other investigator does would have any bearing on what Dr. Ford tells the committee, so there is no reason for any further delay." There is no reason for our fear. There is no reason for the life not to spurt the energy due.